With UT back in session, the Astronomy Department’s free public Star Parties are returning to campus, Wednesday, Friday and Saturday Nights this fall. Every Wednesday night while UT is in session, the Department of Astronomy sponsors free public star parties on the top roof of Robert Lee Moore Hall, which is located at the southeast corner of Dean Keeton (formerly 26th street) and Speedway. Once you reach RLM, take the elevators to the 17th floor and then follow the signs to the stairs up to the telescope. Please note – there will be no public viewing at the Painter Hall Telescope on nights when there is a UT home football game. Not all games have a start time set as of the start of the season, so please check the schedule before planning your visit. Every Friday and Saturday while UT is in session, the Department of Astronomy hosts free viewing on the Painter Hall Telescope. Both Friday and Saturday nights are open to the general public. Painter Hall is located at the corner of 24th street and Inner Campus Drive, just to the north of the UT Tower. 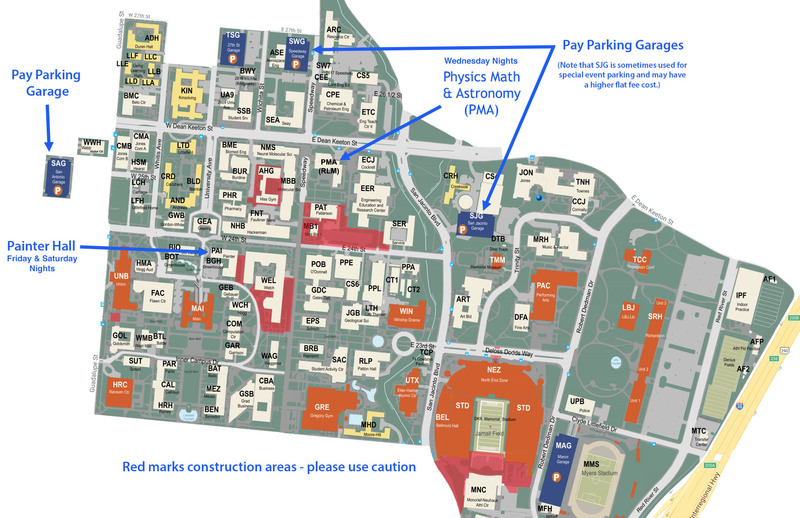 Click here for map to Painter Hall and nearby parking garages. All ages are welcome, but younger children should be under adult supervision at all times. Viewing times change throughout the year, so please check this page before planning your visit. To get to the telescope, take the elevator to the 5th floor and exit to the left. Follow the 5th floor hallway to the end and take the stair case through the double doors on the left. Once you reach the 6th floor, go to your right and follow the signs up to the telescope. If you are interested in bringing a small group of 15 or fewer, you may come to any public viewing night without prior arrangements. If you plan on bringing a group of more than 15, please notify Lara Eakins at least two weeks in advance to avoid having too many groups show up on the same evening.